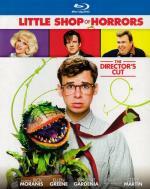 A comedy, a love story and a cult classic starring a giant singing plant from outer space — what else could it be but Little Shop of Horrors? The 1986 film has a surprisingly complex history; it began as a short story, then became a low-budget film, before turning into an Off-Broadway play, when finally Frank Oz and his team created this quirky, dark screen version. Many fans do not know that this adaptation originally had a far more sinister ending, which everyone can now see in the Director’s Cut of the film included in this special edition package. What a great little fun film! It's the only musical I know that has a carnivorous plant bent on world propagation. The cast is great, and the tunes are so catchy - I've had "Feed Me" in the back of my mind since I first saw this film in the 80's. Really recommend watching the director's cut instead of the theatrical release, and that cut makes it well worth the upgrade to blu-ray. The original ending is much, much better (and darker). Recommended for fans of musicals and monster movies everywhere. Directed By: Jules Bass, Arthur Rankin Jr. In this whimsical, animated film, a lone unicorn seeks out others like herself through a mystical land of talking cats and spellbinding magicians. Based on the book by Peter S. Beagle, this story has enamored the hearts of fans – young and old – from around the globe. 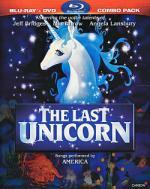 In her search for other unicorns, the last unicorn encounters a cast of delightful characters as well as dangers she never imagined. Throughout the fantastic adventure, she learns of friendship, love and most importantly her true self. Discover the magic that has kept this tale a treasured classic. Featuring the voices of Jeff Bridges, Mia Farrow and Angela Lansbury, the story brings forth the power of friendship, the beauty of love and the pain of regret. Interlaced with songs and ethereal imagery, The Last Unicorn will reignite the hearts of its fans and entrance all who enter. I adore this film. I've loved it since I first saw it as a child and I love it still. Yes, there is a certain nostalgia factor to this, but there are things we love as children that don't hold up as adults (the Dungeons and Dragons cartoon comes to mind). This does. It speaks to me now just as much as it did in the 80's. It has wonderful songs provided by America, and characters that are unique. I love both the tragic love story, and the one that isn't ... and that those who end happily aren't the beautiful people. It's a story of love, heroism, selfishness and sacrifice. It's also pretty true to Beagle's book, which I would highly recommend as well. For me, this is a nigh-perfect film, and a long-time personal favorite. I know it isn't truly a 5-star film, but I don't see it as anything less. Pongo, Perdita and their super-adorable puppies are in for thrills, hilarious spills and an epic action-packed adventure when they face off with Cruella De Vil, Disney's most fabulously outrageous villainess. Unleash all the excitement and suspense of Disney's 101 Dalmatians, a beloved classic you'll want to share with your family again and again! 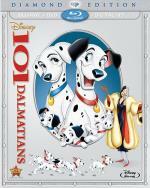 This is a fun classic Disney animated film. One I have not seen since I was a little kid. The style of the animation, while much simpler then what we are used to today, brought flashbacks of my childhood. The story here is fun and keeps your interest with ease. I definitely recommend it... think this is one everyone should see at least once. Celebrate the 70th Anniversary of Walt Disney's Pinocchio! The legendary masterpiece that inspired millions to believe in their dreams has reawakened with an all-new, state-of-the-art digital restoration that shines brilliantly on 2-disc DVD. Now, for the first time ever, the richly detailed animation, unforgettable award-winning music ("When You Wish Upon A Star") and heartwarming adventure-filled story come to life like never before. Plus all-new dazzling bonus features transport you into Pinocchio's fantastic world! Join Geppetto's beloved puppet — with Jiminy Cricket as his guide — on a thrilling quest that tests Pinocchio's bravery, loyalty and honesty, virtues he must learn to become a real boy. The one and only Pinocchio will live on forever in the heart of anyone who has wished upon a star. Pinocchio's Matter Of Facts-on screen trivia. This is another classic animated Disney film I haven't seen since I was a little kid. I remember loving this one as a kid... and I still found it rather enjoyable but probably not as much as I remember it being. It is a fun little story that is well worth the time put in to watch it. The generation gap gets political in this 1957 tale starring legend Mamie Van Doren. Two beautiful and talented sisters on their way to Tinseltown are arrested on trumped-up charges by a corrupt judge and conveniently sentenced to work on the farm of her boyfriend, the local agriculture magnate. There, they join similarly exploited teens working off their own sentences. But when the judge's honest son catches on to the scheme – and one of the sisters – justice, labor reform and rock 'n' roll are not far behind. I don't know if the movie is really so bad as to rate a single star. I couldn't make it all the way through the MST3K episode I watched of this film. That's really more about the show then the movie. I've heard about it for years and thought this was the perfect time to give it a chance. This style of comedy is not for me - I found it incredibly annoying. I'll stick to just watching bad movies as themselves. This spectacular retelling of Gaston Leroux's immortal horror tale stars Claude Rains as the masked phantom of the Paris opera house – a crazed composer who schemes to make a beautiful young soprano (Susanna Foster) the star of the opera company and wreak revenge on those who stole his music. Nelson Eddy, the heroic baritone, tries to win the affections of Foster as he tracks down the disfigured "monster" who has begin murdering those who resist his mad demands. This lavish production remains a masterpiece not only of the genre, but for all time. I just could not get into this one. While it may have had a moment here and there that caught my interest I literally had to force myself to finish this film. First of all I found that opera is just not for me... no way no how! And even then most the scenes without the opera I found to be slow and boring. Oh well... they can't all be winners! Go back to high school with Pink Lady Sandy (Olivia Newton-John), leader of the bad-boy T-Birds, Danny (John Travolta), and a rockin' and rollin' all-star cast. Now available for the first time as a remastered Special Edition Blu-ray Disc, and featuring rockin' bonus materials, Grease: Rockin' Rydell Edition is the word! This film holds a special place in my heart as it was one of my wife's favorite. While not the best film in the world I really enjoyed it. I liked both the setting and the storyline. Matter of fact I think the last time I watched this one I rated it a little low. Well worth the time put in to watch it. Only 6 days left in our competition... will I be able to keep my lead? I got to admit... I feel myself having a harder and harder time getting through all these musicals! For the first time in the entire month I am starting to worry. I think I am too old to watch this movie for the first time. Maybe I would have had a different reaction seeing this for the first time when I was in high school. Sitting here on the other side of that by a quarter-century, the film seems awfully silly. Still, that wouldn't be as much of a problem if I had liked the characters. But the only one I liked was Frenchie. I found Sandy to be very blah, and Danny to be a jerk. The dance numbers and songs were pretty descent, and they pushed it just this side of over average. 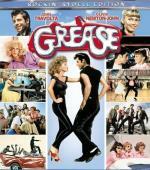 Return to rockin' Rydell High for a whole new term! It's 1961, two years after the original Grease™ gang graduated, and there's a new crop of seniors – and new members of the coolest cliques on campus, the Pink Ladies and T-Birds. Michael Carrington (Maxwell Caulfield) is the new kid in school, but he's been branded a brainiac. Can he fix up an old motorcycle, don a leather jacket, avoid a rumble with the leader of the T-Birds (Adrian Zmed), and win the heart of Pink Lady Stephanie Zinone (Michelle Pfeiffer)? He's surely going to try! No, this one is not as good as the first one. But like the first one this one holds a bit of a special place in my hert. Plus I like this one for the fact that it has motorcycles instead of cars. I have always liked motorcycles. So while I don't know that I would recommend this one to others....I enjoy getting to see this one every now and then. In the not-so-distant future, a worldwide epidemic of organ failures devastates the planet. Out of the tragedy, a savior emerges: GENECO, a biotech company that offers organ transplants...for a price. 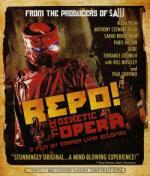 Those who miss their payments are scheduled for repossession...and hunted by the REPO man! I had no idea what to expect going into this one. I found it to be nothing more then an average film as I liked the story... but didn't care much for the style. I found it to just be a little too much on the weird side for my taste. I did like seeing Anthony Stewert Head in something other then Buffy the Vampire Slayer.